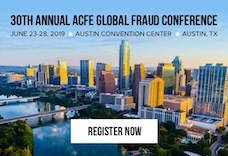 Pulitzer Prize-winning investigative journalist Bastian Obermayer, New York Times best-selling author William Browder, and Director of the U.K. Serious Fraud Office Lisa Osofsky will headline the 30th Annual ACFE Global Fraud Conference, June 23-28 2019, in Austin, Texas. In an increasingly globalized economy, with various compliance requirements that apply not only to an organization, but it’s contractors and vendors as well, one way to stay ahead of fraud and corruption risks to satisfy those requirements involves proactive monitoring to ensure regulatory compliance. In two separate breakout sessions at the 29th Annual ACFE Global Fraud Conference delivered by Eric Feldman, senior vice president and managing director of Affiliated Monitors, Inc., he stressed that companies should take the first step in a proactive monitoring program by obtaining an independent assessment of their organization’s risks, practices or procedures and culture. Most likely, you’ve heard the phrase “leaving a carbon footprint.” We know that traveling, consuming food and even breathing are all activities that release trace amounts of carbon into the atmosphere. The same idea is applicable to a person’s digital footprint. Your digital footprint is the virtual impression of activities you are involved in. Liking your friend’s post on Facebook, purchasing a pair of shoes online, tweeting about how much you loved this year’s #fraudconf — all of these activities are tracked and logged, and combined they are your digital footprint. This is what the GDPR is concerned with: protecting that data. Here’s a tip to keep yourself out of prison: When you find a glitch in your employer’s check-writing software program, do not (repeat do not) write a small check to yourself. If you do, you’ll probably write another. And then another. And then several more. Closure. That’s all Kathe Swanson was looking for. She was the city clerk of Dixon, Illinois, when in October 2011 she discovered some fishy bank statements that implicated longtime comptroller, Rita Crundwell, for embezzling from Dixon. The city fired Crundwell in April 2012. That didn’t give Swanson closure. After an FBI investigation, Crundwell was indicted for stealing $53.7 million from city coffers over two decades. No closure. Crundwell was convicted in February 2013 and sentenced to 19 years and seven months in federal prison. Still no closure. You know that catastrophe you thought might slam your organization? It happened. You got the dreaded phone call in the middle of the night from your lawyers, your compliance people or (horrors!) the media that (pick one or more): 1. Employees created millions of fraudulent savings and checking accounts on behalf of clients without their consent. 2. Management was bribing officials worldwide to win lucrative contracts. 3. Executives were caught in huge money-laundering and corruption crimes.